Halloween is always so much fun. 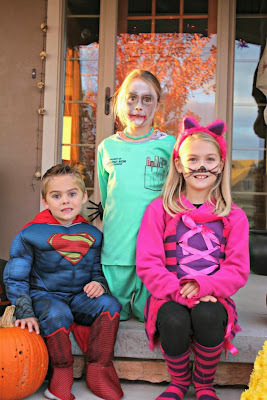 The costumes, the smiles, the running from house to house, the candy. This year was no exception. We left our house at 6 pm after a couple brief pictures. We have to get out early because it gets cold so quick. The kids ran from house to house. Asher was usually in the lead, with Alivia right behind him, followed by Addison and then Alivia's friend Elizabeth who came along with us this year. Unlike last year when Asher would look at the candy and decide whether he liked it or not, this year he was less selective. Addison and Alivia are not selective up front but are quite selective when it comes to eating it. The favorite houses: The ones who handed out BIG candy bars, the lady who gives out $1 bills with candy, the houses that give out treat BAGS filled with candy, and the guy who hands out beer to the parents. LOL...love him. The kids, of course, love hitting up the grandparents house. The temps turned out to be okay, maybe in the upper 40s, but were fine with winter gear. We arrived home about 7:45. Superman, aka Asher, ate a HUGE Nestle Crunch bar in no time and was ready for bed. The girls picked out a few smaller things. Alivia loves peanut butter cups and nerds and Addison likes twizzler pull and peels and tootsie roll pops (oh, and Daddy likes his share of snickers! He is so skinny he has room to eat some, too!). The kids were showered and tucked into bed by 8:45. Chris had all the Halloween stuff down outside by 10. Pretty impressive! Happy Halloween. May you all enjoy your candy without cavities. :) (Oh and P.S., we came back from trick or treating to find no big candy bars and about 25 granola bars! I'm thinking the granola bars were less than a hit. :) ). Cute costumes! Glad you guys had a nice halloween!